The price of fuel is dependent on a number of factors, including the cost of shipping and its cost overseas. According to the Australian Institute of Petroleum (AIP), around 20 per cent of petrol is imported from Singapore and South Korea. Around 95 per cent of the wholesale price of petrol is determined by the Singaporean price, plus shipping costs and Australian taxes. The remaining five per cent comes from insurance, terminal costs and a wholesale marketing margin. AIP’s data shows the wholesale price at the terminal (the Terminal Gate Fee) fluctuates frequently. On August 11, the Melbourne price sat at 110.4c a litre. Compare that with the beginning of August and the price sat at 108.5c, and 107.4c a week before. Rather than waiting for the right time to fuel up, fleet managers are turning to advancements in technology to drive efficiencies in their assets. 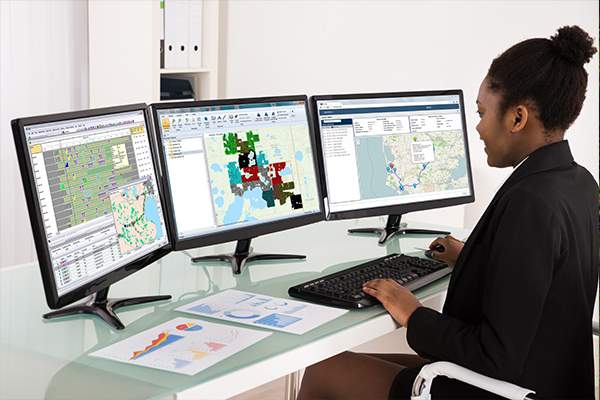 Route optimisation software is one technology that has the potential to reduce the amount of vehicles on the road and kilometres travelled, saving waste transporters money and time. These systems can be used to optimise distribution, pick-ups and collection routes through computerised ‘what-if’ simulations of trucks on the road and expected collection times. Waste management software provider AMCS Group is one organisation leading the provision of route optimisation solutions in the waste industry. In 2009, AMCS partnered with Transvision AB, an international provider of route optimisation software with more than 30 years’ experience headquartered out of Copenhagen in Denmark. Gerard Kissane, Head of ANZ Region, says AMCS acquired Transvision in 2014 due to its ability to handle the complexities of waste collections, and most importantly, its fast speeds of the route optimisation algorithm. “With municipal collections you have on average 1500-1600 stops per route and some of the other algorithms can struggle with that level of optimisation,” Gerard explains. A common problem impacting on driving time, AMCS finds, is the fact that side loader trucks can only handle waste bins angled on the left side of the road. Rear loader trucks capable of handling bins from both sides can cause safety issues if they are used in residential areas, Gerard says. To solve this issue, route optimisation technology can automatically calculate where the vehicles would be most safe to enter, including city centre laneways in the CBD. “You can mix and match your fleet within the software to suit the area. AMCS Route Planner will provide a sequence of the most efficient way to drive from your depot to your disposal point and back. AMCS data estimates that businesses using the route planner technology have allowed them to reduce up to 15 per cent of their vehicles on the road, and up to a 75 per cent decrease in the time spent on planning and administration. Read the full story on page 30 of Issue 14.